The Great Britain SailGP Team reacts after spending two weeks training on the supercharged F50 in New Zealand, and we got an update on their latest planning and activities. Members of the Great Britain SailGP Team are back in the UK after their New Zealand training session. Because the F50 is a one-design class, the Australian boat they were training on will be identical to the team’s own boat, which launches early next year. The training period is invaluable to the teams as they prepare for the inaugural SailGP event in Sydney 15-16 February. Like the other teams, we had three days allocated for our training. Essentially, you climb into half of a real F50 hull and assume your normal positions as helmsman, flight controller and wing trimmer, and off you go. All of the electronic interfaces are the same as on the race boats, so all the buttons are exactly the same as the ones we use to sail and fly the boat. It takes a bit of getting used to, but it’s pretty amazingly realistic. For everyone except myself, this was our first “sail” in an F50 and before we knew it, we were hitting top speeds of 47/48 knots. It was an incredible way to shortcut a lot of the learning and gave the sailors the confidence to pop the real boat up onto the foil with confidence straight off the dock. Next, the team headed to New Zealand’s Northland region to train on the F50 for the first time, alongside the Aussies. Sailing started on the USA race boat and with near perfect conditions and the F50 performed very well. The first day of training was focused on getting familiar with flying the boat and keeping it under control to be able to start preparing for maneuvers. The team continued on this theme for the next day but started adding in more entries into tacks and gybes, and began completing maneuvers. On the third day when the wind had built, the crew focused on tacking and gybing, and by the end of the day, they were very close to completing foiling tacks and gybes despite a steep learning curve. To get where the team did in just a few days on the water was quite impressive, but also an indication of how big the challenge is ahead. The sailing and shore teams then had the chance to go to Warkworth, New Zealand, and get first sight of the Great Britain boat going through the final stages of set up at Core Builders Composites. The boat was freshly painted blue and ready for electronic and hydraulic fit out, whilst the wing was in the process of having branding and the Union Jack added to give it that truly British feel. So what now for the team? The next months will be spent gathering all of the necessary resources for when the boat is officially handed over in February, as well as more gym training and additional days on the simulator. 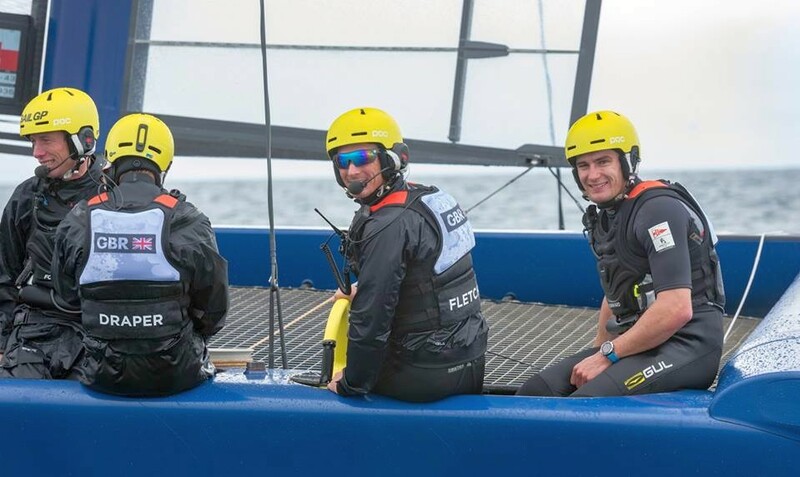 Fletcher and Bithell will continue with their Olympic programme with two training camps in Vilamoura, Portugal, and then the Miami Olympic classes regatta. The majority of the team will travel to Sydney in mid-January to assemble the boat and sea trial it ahead of pair arriving from Miami. The team then have an all-important 1-day training period ahead of the season one kickoff on Sydney Harbour. Anticipation is building for the first 2019 event in February in Sydney, as well as the whole 2019 calendar, highlight by racing in home waters in August. Plans are well underway for Cowes SailGP, which takes place over the first weekend (August 10-11) of Lendy Cowes Week, one of the best regattas in the world. Cowes SailGP will have its own race village along the waterfront towards Egypt Point, with fans, friends and sponsors able to get up close and personal to the action, with racing taking place just metres from the shore.